The sandy bridge connecting Africa and the Middle East, a sweeping landscape cut by the legendary River Nile and littered with ancient treasures and iconic monuments, and cradle of one of human history’s most enduring chapters—few destinations stir as much intrigue in the heart of the adventurous traveller as Egypt. Join us as we head into the Valley of the Kings to see the rock-cut tombs and temples of the Pharaohs, and marvel at the Great Pyramids and Sphinx of Giza—rightfully ranked among the world’s most astounding archaeological wonders. Explore the museums and monuments of Cairo and Alexandria or take an unforgettable cruise down the Nile as it twists through some of the country’s most remarkable landscapes. 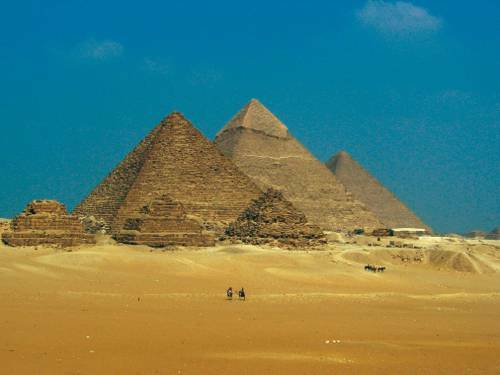 Take a look through our itineraries and start planning your Egyptian adventure of a lifetime! 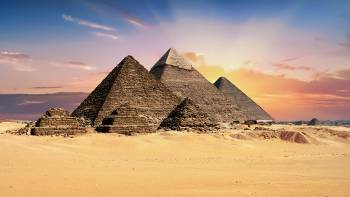 Explore the magnificent Great Pyramid of Giza, the last remaining ancient Seven Wonders of the World. It's an iconic as a symbol of Egypt. 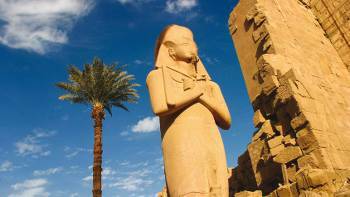 View the grandeur of both Luxor and Karnak Temples on the banks of the Nile River. Our Egypt itineraries offer great value for money, featuring top quality service and atmospheric wilderness camps and accommodation. We aim to incorporate as many inclusions as possible in the tour cost such as most meals, entry fees, private vehicles and transfers, eliminating the need for you to travel with large sums of money. 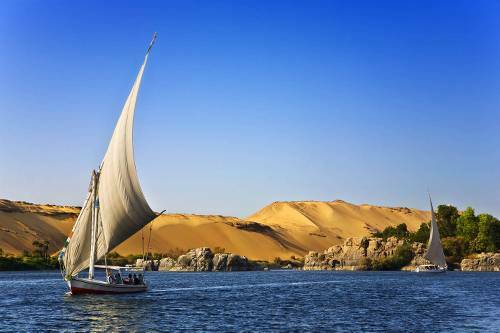 From exploring the Pyramids of Giza to floating on a felucca down the mighty Nile River, our adventures encompass the many highlights of this fantastic country. Our friendly and knowledgeable driver-guides are extremely hospitable and are always delighted to welcome you to their country. From introducing you to the local culture to suggesting the most authentic restaurants, they will ensure your journey is authentic and hassle-free. We use 4 star (Egypt rating system) hotel accommodation in the cities, all twin share with private facilities. Please do not expect the hotels to be of a western 4 star standard. Some hotels are clearly 3-4 star, and some are closer to 2-3 star, however they are chosen for their position, cleanliness and comfort. This is a traditional and basic sea-craft with broad canvas sails. The craft is mainly reliant on wind power, and so itineraries are subject to change according to the winds. The felucca carries 1 to 10 people, and the deck is strewn with soft cushions and rugs, and covered by a canopy that offers shade and protection from the sun. You will need to bring your own sleeping bag (not provided) to sleep on the mattresses on the deck. There is a communal shower/toilet on board. We use a 4 star Nile river boat, all twin share with private facilities. 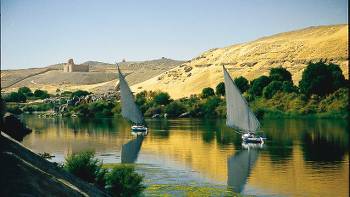 During the Nile cruise there will be other groups of all nationalities on board as we will be joining a public vessel. However sightseeing and activities will generally be conducted in our own group. With the exception of the winter months, Egypt is mostly hot and dry with temperatures rising to as high as 41 degrees Celsius on average in June. Our departures occur between September and June when the temperature is best for the types of activities we will be undertaking, including cruising by boat on the Nile. Aswan is quite hot during the day even in the middle of winter, and a hat and sunscreen is essential for all departures. From November to February the temperature ranges from 8 to 27 degrees Celsius on average, whilst rainfall is practically unheard of at this time. Cairo will be slightly cooler. Therefore you will require light thermals and a warm outer layer for evenings, when temperatures can fall near to freezing. ATM's are common in cities, towns and resorts. Visa is widely accepted. Electricity in Egypt is 220 Volts, at 50 hertz. The most common pin type is C. (2 round prong). Citizens from eligible countries (which includes Australia, Canada, United States, United Kingdom) can purchase a tourist visa on arrival into Egypt at the kiosks at Cairo International Airport or other authorised airports. It is necessary to queue, fill out an application, purchase the visa sticker to present along with your passport at the immigration desks. Requirements: Travellers must be from one of the eligible countries and have a passport with six months remaining. You cannot pay the visa fee with a credit or debit card so it necessary to take US Dollars cash with you (NB. Egyptian Pounds or other currencies aren't accepted as payment for tourist visas). It’s also best to take the exact amount to save trouble. The visa on arrival allows visitors to spend up to 30 days in Egypt and only allows one entry into the country. After you have completed your e-Visa application and made the payment, your application will be processed. Await approval via email, then download and print the e-Visa from your account on the Egypt e-Visa Portal. The Egypt e-Visa is valid for 90 days from the date of issue. If the visa expires before use, the applicant is required to apply for a new visa before travelling. The dates cannot be modified once the visa has been approved and sent via email.